Embellishing handbags to fit your personal style transforms a simple bag into a wearable art. This purse all started with a button. My brother-in-law bought me a beautiful new jacket as a present, and attached along with it, a stunning multifaceted button. I retain a collection of buttons and beads from numerous sources hidden away in my sewing supplies. They only see the light of day when I open the box to add a new button or a new bead. I could not, however, add this cherished button to the forgotten button stash. 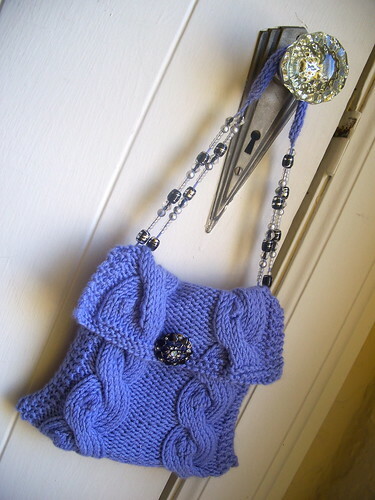 Pulling out a luxurious silk/cashmere yarn, I designed this shoulder bag to showcase the buttons beauty. With its simple rectangular construction and cable/bobble lines, it will easily highlight your treasure as well. Beaded handles add depth, and they are as easy to create as the bag itself. Its beauty can only be enhanced by your imagination! C10F: sl 5 sts onto the cn and hold in front of work, k5 and, k5 from cn. Bobble Increase: K into front, then back, then front, then back, then front again of next st: 1 st increased to 5 sts. Bobble Decrease: P5tog. 5 sts decreased to 1 st.
Beginning on row 3 of following pattern, work 8 pattern repeats. Knit 8 rows. BO and weave in ends. CO 4 stitches using double pointed needles. Knit across. Instead of turning, slip the stitches back to the beginning of the needle and knit the row again. As you pull the i-cord straight, the gap on the back will tighten up and close. Continue in this manner until it is 6 inches. Cut yarn leaving 8-inch tail, and thread the yarn through the stitches and pull firmly. Cut one 24-inch length of yarn. Thread through the middle of the i-cord. Now you will have an i-cord with two strands of yarn on the ends. Tie a knot to secure the tails to the i-cord. The beads are packaged on a plastic wire to ensure easy transfer to your project. Simply, tie the bead wire to the yarn, and slide beads from the wire to the yarn handle. Fold 5 inches of bottom up and seam sides. Attach the i-cord handle by spreading out the two strands and threading them through the top of the purse and tying a knot. Repeat on other side. For the lining, cut a 6-inches by 12 inches rectangle from lining fabric. Fold fabric in half lengthwise, and sew 6 inches of each long edge of rectangle, beginning at fold. Fold over 0.5 inch of the top edges of lining and press. 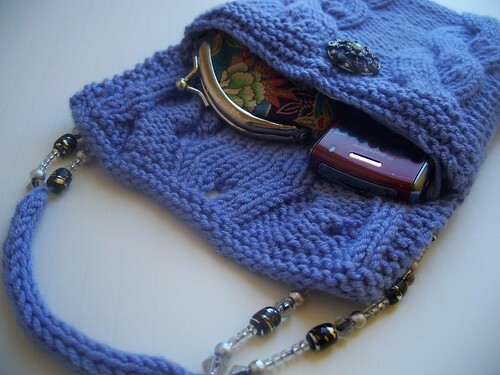 To hide the ends of the handle, slip fabric pocket with wrong sides facing out inside the purse, covering the strap knots and sew around the top. Attach button to front of purse. Copyright 2009. 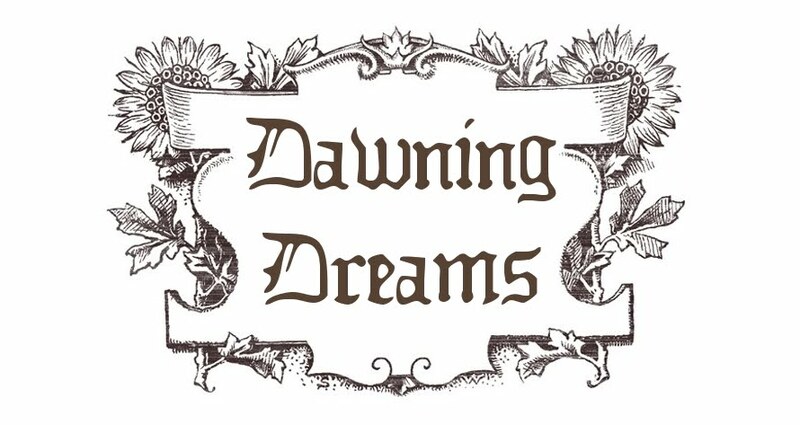 Dawn L.E. Riden. hese patterns are for personal and non-profit use only. You may not sell items made from these patterns. You may make them for yourself, as gifts, or for donation to charity sales or auctions. 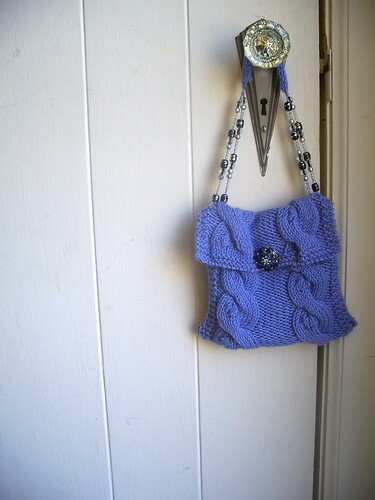 And these patterns love being used for knitalongs or other organized knitting events that are free of charge. Merchants may not download or print these patterns for sale, free distribution, or class use without prior written permission from the author. If you received one of these patterns directly from a yarn store, or are taking a paid class using one of these patterns , please verify that the store has written permission from the author. Printing or downloading a pattern constitutes agreement with these terms. It had a special treat in my inbox today when I found out that I was featured in todays Luvhandmade.com. 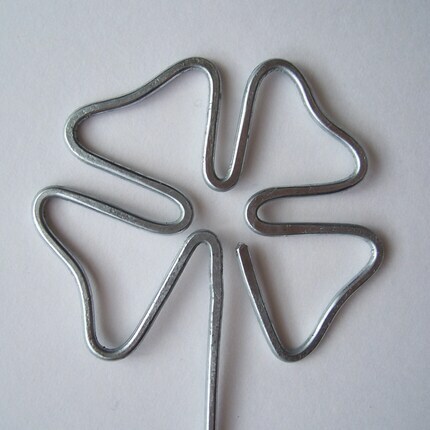 It featured Irish items in honor of St. Patrick's day coming up, so my 4 leaf clover orifice hook was included. Check it out, leave comments, and enjoy! In case you haven't known, I've been busy these past couple of weeks getting things together for the Phat Fiber box. I've been spinning and packaging and mailing and everything in between getting everything done in time. February's box was a wonderful collection of fibers, yarns, and other odds and ends that tickled my imagination on the stuff I would like to make. Just in case you missed it, here's my box. Now, for the first month I will be submitting, I wanted to do something special. I normally wouldn't send in sample that take me so long to make. 45 of them none the less! But I wanted everyone to get something special for the first time. So I made shawl pins that were Celtic themed for everyone. It took time and patience, and I smashed my fingers a couple of times, but I think everyone will appreciate their treats. If you would like to purchase one of my creations, you can check my Etsy store out at DawningDreams.Etsy.com. If you would like to get a Phat Box of your own, you can get it at PhatFiber.Etsy.com.